Preliminary research into the application of spectrophotometry for localizing and identifying neurovascular structures, such as large arteries, veins, and nerve stems, in the process of neurosurgical navigation was carried out. The results of preliminary in vivo and in situ experiments confirm the possibility of developing appropriate quantitative criteria on the basis of measured spectrophotometric parameters and calculated optical and physio-logical parameters of the investigated biological tissue volume. Further verification of the obtained data is required. 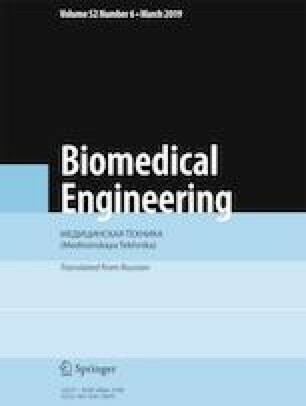 The results obtained in this work can be used in designing a system for the automated intraoperative detection and identification of neurovascular structures. Translated from Meditsinskaya Tekhnika, Vol. 52, No. 6, Nov.-Dec., 2018, pp. 28-31.